Bradford Council is funding the delivery of a national programme to help young people from starting to smoke, and their parents or carers to quit. QUIT, the UK charity, is rolling out Smoke Free Family Life across ten secondary schools in the district and Bradford is one of the newest areas of the country to sign up to the scheme. A QUIT youth presenter will work in secondary school with pupils and make sure they take a support booklet home with them which will include details of support details of the council’s stop smoking service. The Council are participating in a national and local evaluation to help young people from starting to smoke and their parents or carers to quit. The aim of the project is to give young people the facts about smoking so that they can make an informed choice and to support parents and carers who smoke to stop. The project is being run in conjunction with the Bradford stop smoking service. Andrew Gillespie, Stop Smoking Specialist for Bradford Council, said: “We know that two thirds of smokers start smoking before the age of eighteen so it is important to provide effective programmes like the one provided by QUIT.” “Our aim is to help create a smoke free district where the next generation understand that smoking is a normal activity and that cigarettes kill one in every two long-term smokers.” “Teenagers are making their own decision not to smoke as fewer youngsters are starting smoking than in previous generations. Hopefully they can help inform their parents and careers that it’s never to late to quit smoking.” You can contact Bradford’s stop smoking service on 01274 437700. QUIT’s position on e-cigarettes is that the evidence is that they are much safer than smoking and are proving an important route out of smoking for thousands of smokers. They do not pose a significant risk to bystanders and are not acting as a gateway to smoking in young people. We will continue to monitor the evidence and if the situation changes, we will revise our position. We here at QUIT are very excited to announce the launching of two new guides aimed at helping people quit smoking. 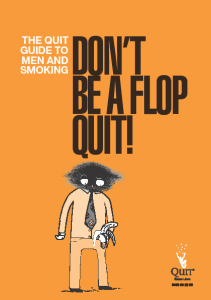 We have created a brand new guide for men entitled Dont Be a Flop QUIT: The Mens guide to smoking. In this guide we provide men with information on the affects that smoking has on both their health and personal lives, as well as provide them with valuable information on how they can go about quiting smoking. We have also updated our guide entitled So You Want To QUIT to provide people with the most up to date options for quiting smoking. Both of these guides can be acessed here. Buckinghamshire County Council is participating in a national project to help stop young people from starting to smoke and their parents/carers to quit. QUIT, the UK charity is rolling out Smoke Free Family Life across the country including Buckinghamshire, the county where the project originated. A QUIT Youth Presenter is working with local schools to deliver presentations to pupils as well as giving out booklets that include details of local stop smoking support for parents or other family members. Booklets that aim to educate the children and young people about the harms of smoking are also being given out. The project is being evaluated by University College London as part of a nationwide evaluation to identify how using a whole family approach to educating young people on the harms of smoking, helps to reduce the numbers of young people starting to smoke and increases the number of adult smokers quitting. The project aims to give young people the facts about smoking so that they can make an informed choice as well as supporting parents/carers who smoke to stop. The project is being run in partnership with the Buckinghamshire stop smoking service.